DC Home and Condo Prices: Neighborhood Prices: How Much? As I mentioned in a previous post, I now have the capability to calculate recorded sales on a price per square foot basis. For July, I thought I'd see what the average price per square foot was for each neighborhood. These are tax assessment neighborhoods, not the more commonly known neighborhood names, e.g., Old City II vice Dupont Circle or Penn Quarter or, heaven forbid, NoMa. 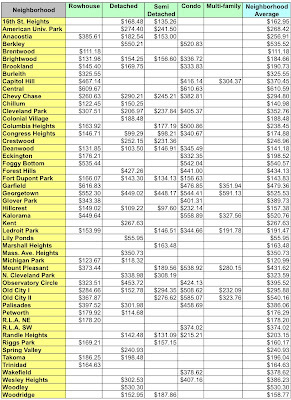 The table below shows the average price per square foot for each housing category in each neighborhood. The data available to me is incomplete, so while 769 sales were recorded in July, I have appraisal data for only 585 of those condos and homes whose sales were recorded that month. The biggest data gap is newly built condos. It's interesting to see the disparity in some areas between the prices of condos and houses. For example, on a per square foot basis, it's cheaper to buy a house than a condo in Cleveland Park. In fact, in most areas a condo is the most expensive form of housing, and that's before condo fees are included. The analysis presented is derived from District data on sales recorded during July. My analysis is based on District sales and appraisal data that I've collected and processed. Errors are always possible.